Yet another powerful AutoFem variety pack from the Paradise Seeds. 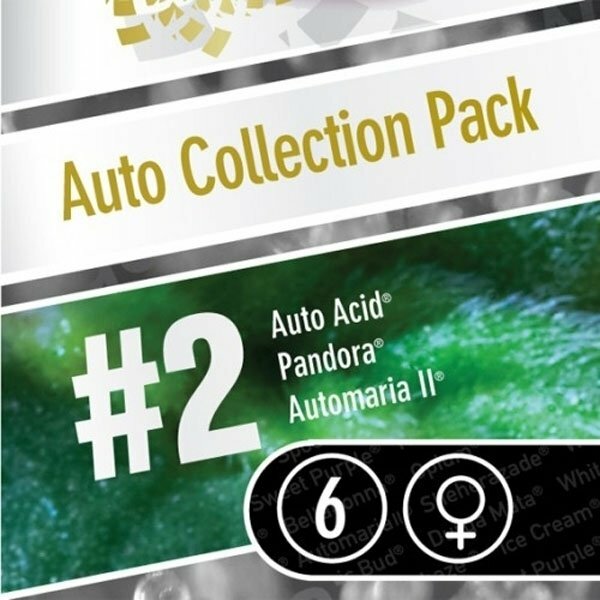 Try three different autoflowering strains - Auto Acid, Automaria II and Pandora - and judge the growing popularity of AutoFem varieties for yourself. A perfect choice for small scale growers willing to try something new, or as a trial pack for commercial growers. Auto Acid is a Sativa dominant hybrid derived from the Paradise Seeds Diesel. Though it takes a week longer than the fastest AutoFems, at 75 days from germination it is still a great choice for inpatient growers. A powerful, uplifting Sativa high, with yields of 400 g per sq meter indoors and more than 100 g outdoors. Automaria II is a Sativa/Indica hybrid with distinctive Sativa dominance, manifesting itself mostly in the euphoric, mood lifting high. Ready for harvest after just 65 days from seed, yielding 350-450 g per sq meter indoors and approx. 75 g per plant outdoors. Pandora is the only Indica dominant strain in the pack, with 90/10 Indica/Sativa genetics. An autoflowering descendant of such acclaimed cannabis varieties as Sensi Star or pure Afghani. Deep, relaxing stone, perfect for recreational as well as medical uses. The Paradise Seeds was awarded the second prize at the High Life Cup in 2012 for this strain in the Autoflowering category.